When poverty-stricken animal hunters are killed by wildlife, many people see it as poetic justice. This is why it's not. 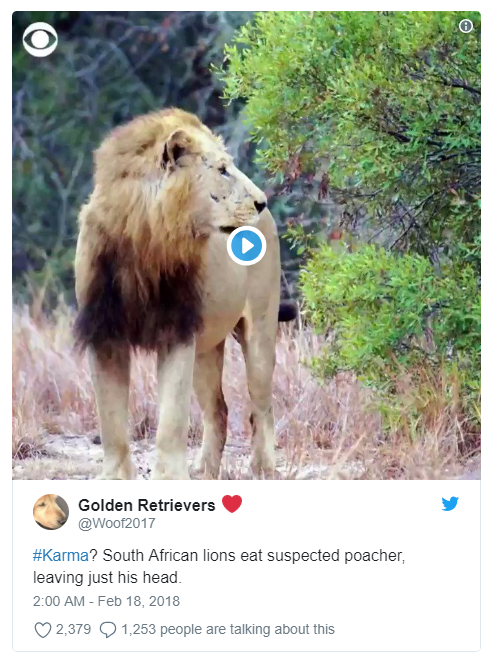 In early February of 2018, news of a lion attack came out of Kruger National Park in the Limpopo district of South Africa. 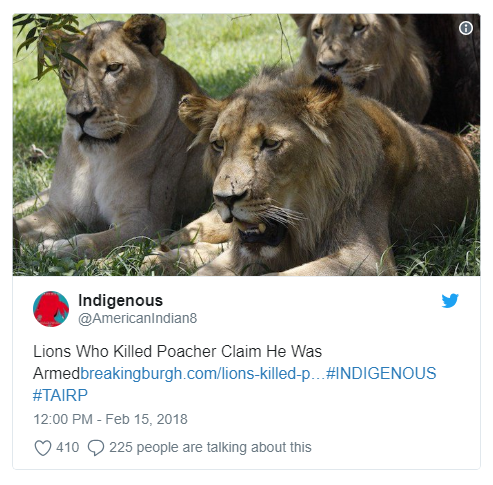 A suspected poacher had been killed and consumed by a pride of lions, who left behind only his head and the loaded gun with which he had allegedly planned to kill them. While lion attacks are not unheard of in southern Africa, this story quickly gained international attention. Unlike incidents before it, the irony of a would-be hunter killed by his own prey struck a chord across the globe. 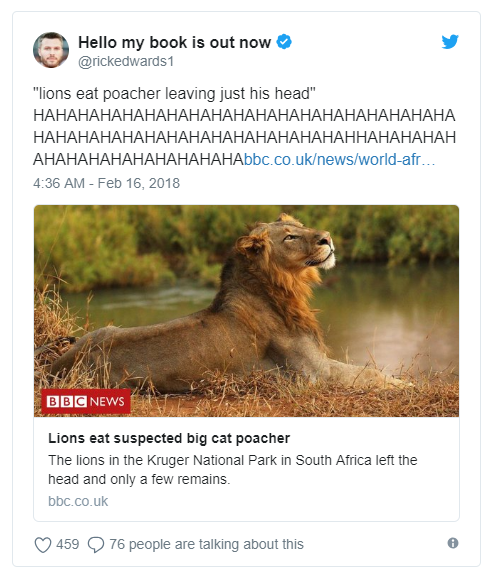 “SUSPECTED POACHER EATEN BY LIONS” read the CBS news headline. While several Twitter users called for sensitivity, the Twitter community at large deemed the poetic justice too perfect to dismiss. 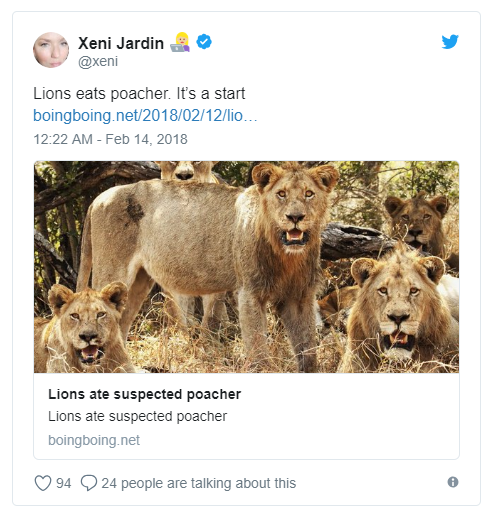 Even before a woman entered Hoedspruit Police Station on the western edge of Kruger to identify the poacher’s bloodied head as that of her brother, the story was a trending topic across social media, and news outlets had curated collections of the "funniest" Tweeted responses. The story of David Baloyi’s death and the gleeful indifference to which so many responded to it underlines a fundamental misunderstanding about poachers and poaching across southern Africa. As disturbing as poaching is -- and, to be clear, it is very disturbing -- it is far from a get-rich-quick scheme. In fact, most of the people in Mr. Baloyi’s position are barely getting food on the table. There are different kinds of poaching -- the kind backed by organized crime and syndicates, and subsistence poaching for food, especially in communities suffering from endemic poverty. In either case, the ones doing the actual poaching, much like in the drug trade, have few other options. David Baloyi had crossed the border into South Africa from his home in Mozambique, a country where 54 percent of the population lives below the poverty line. The average annual income in Mozambique is $250 and the economy is still stagnating due to a decades-old civil war that crippled the nation. then you’ve got nothing to lose. As countries from Botswana to Tanzania impart ever harsher sentences on poachers, they address a symptom while ignoring the glaring problem at the source of the poaching epidemic: poverty. As long as there is a demand for ivory, rhino horn, big-cat pelts, lion bone and any other elements of the 4,952 species identified by CITES (The Convention on International Trade of Endangered Species) as endangered -- and there is demand -- and as long as there aren’t viable economic opportunities for the most destitute -- and there aren’t -- animals will continue losing their lives at rates that could drive them to extinction. Van Lente is of course referencing the tourism that the wildlife could bring. In other countries, wildlife tourism can be very insular, only benefiting those who work in the reserve or the park. Mozambique has taken steps to ensure that wildlife tourism benefits the whole community and thus the whole economy. Mozambique law requires that 20% of profits from wildlife tourism has to be invested into the communities around parks and reserves. If more countries and conservationists follow suit and address the poverty that makes poaching such an appealing option, we may see an end to the killing. If not, we’ll continue to see animals slaughtered -- and the tragic death of men like Mr. Baloyi right alongside them.